Syndicate Collection features an integrated wire/cable management system and 1" thick thermally fused surfaces that resist stains and scratches. All desks and Corner Solutions come with a four-port USB hub to minimize wiring between office components. Use Corner Solutions as a standalone unit or add a desk at either side to form efficient L-shaped configurations. Hutches include electronics charging station, which accepts standard power outlets. Lateral file accommodates letter-size or legal-size files. Drawers have ball-bearing slides with full extension. 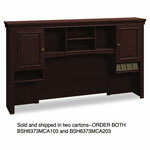 Furniture meets or exceeds applicable ANSI/BIFMA standards. Must order both box 1 and box 2 of double pedestal desks, L-shaped desks, Corner Solutions and hutches for the complete unit. Freight Delivery: $85.00 - for 1st unit. Due to the size, shape and/or weight, this item will ship via a common carrier or freight service, incurring freight delivery fee. Please allow 3-10 business days for freight deliveries. *Each additional unit is charged a percentage increase to the original freight delivery fee, not the full amount.